I'll be the first admit. I try not to get caught up in the drama Tumblr likes to cause because I have a problem with the larger part of the user base in the first place. They seem to have created their own backwards society. But this is unacceptable. Steven Universe is a beloved animated children's show known for its smart and progressive depictions of its diverse and lovable cast of characters. But these positive qualities in the show itself have led to a very ugly turn of events in the Steven Universe fandom, after a beleaguered fanartist said she attempted suicide after being bullied by members of the fandom who felt her art was problematic. In a bizarre turn of events prompted by the ensuing debate over what kinds of fanart are acceptable, some fans have now turned even against the show's creative team, including show creator Rebecca Sugar. I just felt like issues like this should be brought to light. I understand that there can be lines between what art is acceptable and what is not, but there is no excuse for the bullying they have perpetrated. After the Keystone Motel fiasco a little while ago, people (including myself) were calling the SU Fandom the second coming of the Homestuck Fandom's 2011-13 zenith, but it has surpassed that into something much worse now. My friends and I were discussing this the other day and I can honestly say that the Steven Universe fandom is flat out ugly. I don't mean to be rude or bash anyone but honestly speaking this sort of behavior is so hard to fathom for me. I personally enjoy the show a lot, it is probably the only televised western animation I still watch honestly speaking. But I refuse to be apart of this fandom. How can a show that speaks constantly on acceptance, respect, compassion, friendship, fellowship what have you have such an intolerant, conceited, ignorant, childish, the list goes on fandom? It's like, are we watching the same show? It just goes to show extremists exist in every form of any following whether it be a religion or a animation conceived by a 28 year old. Humanity man. You gotta love them. I understand what you mean, Relix. It's shameful that people get so hateful over what is, at its core, a children's cartoon. Yeah, maybe it touches on things deeper than something like Uncle Grandpa or Fairly Odd Parents or what have you, but that's just so that everyone can enjoy it when their kid insists on watching it. When they came up with this show, they never had this in mind. I think people forget things like that. It's sickening to see people who preach about how this show, as you stated, pushes acceptance, forgiveness, friendship, respect, compassion and everything else, turn around and lash out at someone who simply drew art in their own style. So what if her Rose isn't heavy? That's what head canons are. There's nothing wrong with it. At the end of the day, it's just plain infuriating. Definitely, while yes I don't believe someone's race or body should be altered because "I like them better like this" doesn't mean I have the right to put someone down, especially to the point where you're pushing them to suicide. While yes, someone can argue that they didn't actually attempt suicide and is looking for more sympathy where there was none, that does not mean the bullying was fake. Suicide attempt or not, no one should be victimized for how they view something even if it an unpopular opinion. You're completely right. Everyone is entitled to an opinion, there are no wrong opinions. That's how opinions work. But that doesn't give you, me, or anyone the right to shove it down someone else's throat because our opinions do not match. For example. I have a friend who's very religious and prays to God every night. I on the other hand, choose to not believe because my opinion on religion and faith differs from his. Neither of us shoves it down the others throat because we respect one another and are smart enough to understand each is entitled to their own view. I don't mean to go onto a mini-rant here, but I just want to put this out there and get it off my chest. Tumblr has this kind of crazed, backwards society. They say everyone is welcome, no matter who or what they are. Yet, if you're cisgender, straight, white, male, a combination or who knows what else, you don't belong and they hate you. They damn near persecute you for being different. They live in the world of tumblr where everyone can be whoever or whatever they want, forgetting that reality isn't like that. I saw a post once, where someone stated "Who even is straight anymore?" and someone replied perfectly with "96% of the world's population still identifies as straight. 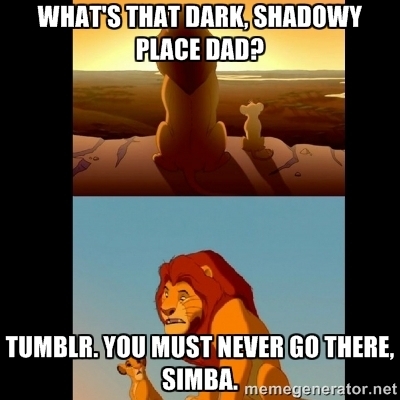 Remember, kids, there is a world outside of tumblr." More often than not, they are the kids who were bullied in school for being different and being on this website where there are tons of people who are like them, they end up becoming bullies themselves. Not every white person is bad, not ever straight person is bad, etc etc. But don't tell them that. They love to tear down people's idols or role models because of something 'problematic' they did years ago, because apparently they are still accountable for some off-hand comment they made back in 2009. Sorry, like I said, I just wanted to get that off of my chest. The fandom should be disgusted with itself. They're always preaching that fandom means sticking together and being there for each other, yet they allowed this to happen? Once again the internet shows what apathy and the witch hunting mentality can do. If I saw this happening in the Kingdom Hearts Tumblr fandom I would have at least done something. And this is why I will never associate myself with Tumblr. The place might have some good pictures, but it doesn't seem worth all this grief. If the communities there get that vicious over a Cartoon Network series, I'm concerned about what happens to less lighthearted and serious topics. Bullying people over art of all things is so weird. If you don't like their art why not just scroll away? You really don't want to see how bad it gets, I can't stress that enough. Yeah, the amount of times i've actually seen that first thing is about... never. Although i don't condone some of the behaviour that resulted in Zamii's unfortunate suicide, criticising and discussing how we reflect society and culture in art is super important, i just wish this could've been handled in a way that didn't turn to harassment. Having privileges in real life won't get you hate on tumblr, nor is it 'the worst thing you could be' on there. Tumblr is super big, and in amongst there is literal neo nazis so like... you'll be right, just be respectful. I can't really agree with what you say since it hasn't been apart of my experience on there, but 'you don't belong and they hate you. they damn near persecute you for being different' ehh... that happens in real life who don't have the same types of privileges as you, so chill. no need for the hyperbole. Talking about hyperbole: "who even is straight anymore?" it's not even persecuting straight people, it's more so seems like they're expressing their experience of the amount of LGBTA peeps that been poppin up. like in my experience i had a group of friends when i was younger, none of us turned out to be straight. it's funny how it turned out like that, i might even use the above hyperbole, but that doesn't mean i am oppressing straight people in any way. Not when i know this group of friends is only 4 people, me included. So hence i feel like this person is literally doing and/or experiencing the same thing, straight people aren't going to be forgotten or oppressed, especially according to that statistic. It's really unfortunate that something like this occurred in conjunction with a wonderful tv show that promotes really positive messages. I hope that the community and try to get together to try and become a much less toxic space. However a large thing to consider is that at apparently 260 million users, people are going to have differing opinions and will probably argue, however so there's a large portion that doesn't, so it's difficult to try pin it on the people who may have had a hand in it or that just let it happen. However we all should bear the burden of responsibility, and i just hope people can explore and experiment, however if they do make mistakes or make something problematic, that as a community we can understand and teach people about the subject so they can make better choices next time, and that it doesn't become so toxic that it would do this to a person. I wanted to join tumblr, but now this happened, and I completely change my mind. It seems bullying has gotten worse over the internet filled with people who love to hate because they can say anything they want. Judging fan art seems to be one thing, but insulting the creator and bashing isn't necessary. Also.... What's the big deal for making Rose thinner? It's fan art. I've heard a bit about this just recently. I don't have a Tumblr account (I refuse to get one), but I browse through the site sometimes because it has a lot of great art and fandom blogs. After hearing about this a few times, I went to look this person up and found their YouTube account. The first video I found was a quick draw video of Sardonyx and the comment section was a battle ground because "Zamii was whitewashing Sardonyx by not giving her an afro/giving her "white-people hair"". I haven't done too much research into it because it looks headache inducing. I stopped when I looked at one of the creators Twitter who was defending the fans' right depict things how they like in their fanart and was getting backlash. It's a really awful situation. I mean, keep in mind that tumblr is just a website. It's not exactly a hivemind, seeing as there are blogs that are actual neonazis or just aesthestic blogs in addition to the ones tumblr is apparently known for. Sadly bullying is on any and most sites of any kind. This kinda thing though just disgusts me. Do people have nothing better to do than bully or be petty over things? the internet as a whole is a toxic place. i've seen the good, and the bad side of tumblr. the bad side is overwhelming, the SJW who are overbearing, contradictory, then there are the people who spur them. it isn't for the faint of heart, groups of 12 year olds spreading hate amongst each other. many aren't literally 12 y/o, but the level of maturity is close enough. I understand what you're saying. I admit, I was pretty much generalizing what I have personally seen on Tumblr. 260 million users, and I follow well close to 200 blogs and those situations just manage to keep popping up. I don't meant to say that they're oppressing anyone who is straight, or whatever else. It just seems to me that they look down on you for it. I've had one anon in particular who called me 'cishet scum' and it just baffled me. I guess I just think its strange that there are people who think that I'm strange because I happen to identify my gender based on my designation and birth and naturally being attracted to the opposite. You'd think they'd be happy for someone that does that. I've seen others get similar hate, but I've also seen well-deserved messages as well. As far as the statistic, I get what you're saying there as well. It was most likely more of an off-hand comment, I'm sure, but then there are some people on there that take it completely seriously as well. It might not be a hivemind mentality out there, but a lot of times I've seen them jumping on bandwagons without doing so much as a modicum of research before. Though, I guess that's just people for you. It's probably worth noting that a lot of the "lol who even is straight" type posts are tongue-in-cheek, ironic, or in-jokes. Look I have see! Some of the best and the worst of tumblr and plenty of websites and fandoms. This is a shame that happened, and I'll pray for the artist's friends and families. The problem that isn't addressed is why these "bullies" are acting in such a way on tumblr, a medium that allows for anonymous asks and messages, and for people to send "fan mail." While it's disturbing that the atypical hivemind is at work (mob mentality), the better question is why all these people choose to act this way on the internet - and more than likely do not in real life within the concrete public space. Most likely these individuals act in an abusive manner in order to release whatever stress levels/real life issues that they refuse to look at or try to solve. In actuality, they should be seeing/talking to a therapist or psychologist, since it can be construed that their parent(s) are not in the picture. It's very easy for [ignorant, stupid, misguided, immature, angry] people to get whipped up into a mob mentality. Sure, it's a sad case of driving someone to suicide or attempt it - but this won't be the last time this occurs, on tumblr or anywhere else. There's also the feeling of being justified. I haven't researched deeply into the ordeal, but many felt that zamii was making "problematic art", therefor, she deserved whatever she got. Looking at the one YouTube video comment section alone, she was labeled as racist, so what was done with the intention of higher morality became a toxic circle jerk and a witch hunt. What makes the situation so disturbing (and scary) is that many of the attackers felt that they were in the right. They were "calling out a racist and problematic person" without realizing that they were being even more horrible. It's basically a case of: good intentions - terrible results.